This article is about the day in the Gregorian calendar. For the 2015 Danish film, see April 9th (film). For the Arthur episode, see Arthur (season 7). April 9 is the 99th day of the year(100th in leap years) in the Gregorian calendar. 266 days remain until the end of the year. 1288 – Mongol invasions of Vietnam: Yuan forces are defeated by Trần forces in the Battle of Bach Dang in present-day northern Vietnam. 1388 – Despite being outnumbered 16 to 1, forces of the Old Swiss Confederacy are victorious over the Archduchy of Austria in the Battle of Näfels. 1413 – Henry V is crowned King of England. 1440 – Christopher of Bavaria is appointed King of Denmark. 1454 – The Treaty of Lodi is signed, establishing a balance of power among northern Italian city-states for almost 50 years. 1511 – St John's College, Cambridge, England, founded by Lady Margaret Beaufort, receives its charter. 1585 – The expedition organised by Sir Walter Raleigh departs England for Roanoke Island (now in North Carolina) to establish the Roanoke Colony. 1609 – Eighty Years' War: Spain and the Dutch Republic sign the Treaty of Antwerp to initiate twelve years of truce. 1609 – Philip III of Spain issues the decree of the "Expulsion of the Moriscos". 1682 – Robert Cavelier de La Salle discovers the mouth of the Mississippi River, claims it for France and names it Louisiana. 1782 – American Revolutionary War: Battle of the Saintes begins. 1860 – On his phonautograph machine, Édouard-Léon Scott de Martinville makes the oldest known recording of an audible human voice. 1865 – American Civil War: Robert E. Lee surrenders the Army of Northern Virginia (26,765 troops) to Ulysses S. Grant at Appomattox Court House, Virginia, effectively ending the war. 1909 – The U.S. Congress passes the Payne–Aldrich Tariff Act. 1914 – Mexican Revolution: One of the world's first naval/air skirmishes takes place off the coast of western Mexico. 1916 – World War I: The Battle of Verdun: German forces launch their third offensive of the battle. 1917 – World War I: The Battle of Arras: The battle begins with Canadian Corps executing a massive assault on Vimy Ridge. 1918 – World War I: The Battle of the Lys: The Portuguese Expeditionary Corps is crushed by the German forces during what is called the Spring Offensive on the Belgian region of Flanders. 1937 – The Kamikaze arrives at Croydon Airport in London. It is the first Japanese-built aircraft to fly to Europe. 1939 – African-American singer Marian Anderson gives a concert at the Lincoln Memorial after being denied the use of Constitution Hall by the Daughters of the American Revolution. 1940 – World War II: Operation Weserübung: Germany invades Denmark and Norway. 1940 – Vidkun Quisling seizes power in Norway. 1942 – World War II: The Battle of Bataan ends. An Indian Ocean raid by Japan's 1st Air Fleet sinks the British aircraft carrier HMS Hermes and the Australian destroyer HMAS Vampire. 1945 – Execution of Dietrich Bonhoeffer, anti-Nazi dissident and spy, by the Nazi regime. 1945 – World War II: The German pocket battleship Admiral Scheer is sunk by the Royal Air Force. 1945 – World War II: The Battle of Königsberg, in East Prussia, ends. 1945 – The United States Atomic Energy Commission is formed. 1947 – The Glazier–Higgins–Woodward tornadoes kill 181 and injure 970 in Texas, Oklahoma, and Kansas. 1947 – The Journey of Reconciliation, the first interracial Freedom Ride begins through the upper South in violation of Jim Crow laws. The riders wanted enforcement of the United States Supreme Court's 1946 Irene Morgan decision that banned racial segregation in interstate travel. 1947 – United Nations Security Council Resolution 22 relating to Corfu Channel incident is adopted. 1948 – Jorge Eliécer Gaitán's assassination provokes a violent riot in Bogotá (the Bogotazo ), and a further ten years of violence in Colombia. 1948 – Fighters from the Irgun and Lehi Zionist paramilitary groups attacked Deir Yassin near Jerusalem, killing over 100. 1957 – The Suez Canal in Egypt is cleared and opens to shipping following the Suez Crisis. 1959 – Project Mercury: NASA announces the selection of the United States' first seven astronauts, whom the news media quickly dub the "Mercury Seven". 1960 – Dr Hendrik Verwoerd, Prime Minister of South Africa and architect of apartheid, narrowly survives an assassination attempt by a white farmer, David Pratt in Johannesburg. 1961 – The Pacific Electric Railway in Los Angeles, once the largest electric railway in the world, ends operations. 1967 – The first Boeing 737 (a 100 series) makes its maiden flight. 1969 – The first British-built Concorde 002 makes its maiden flight from Filton to RAF Fairford. 1975 – The first game of the Philippine Basketball Association, the second oldest professional basketball league in the world. 1976 – The EMD F40PH diesel locomotive enters revenue service with Amtrak. 1980 – The Iraqi regime of Saddam Hussein kills philosopher Muhammad Baqir al-Sadr and his sister Bint al-Huda after three days of torture. 1981 – The U.S. Navy nuclear submarine USS George Washington accidentally collides with the Nissho Maru, a Japanese cargo ship, sinking it. 1989 – Tbilisi massacre: an anti-Soviet peaceful demonstration and hunger strike in Tbilisi, demanding restoration of Georgian independence, is dispersed by the Soviet Army, resulting in 20 deaths and hundreds of injuries. 1991 – Georgia declares independence from the Soviet Union. 1992 – A U.S. Federal Court finds former Panamanian dictator Manuel Noriega guilty of drug and racketeering charges. He is sentenced to 30 years in prison. 1999 – Kosovo War: The Battle of Košare begins. 2003 – Iraq War: Baghdad falls to American forces. 2005 – Charles, Prince of Wales marries Camilla Parker Bowles in a civil ceremony at Windsor's Guildhall. 2009 – In Tbilisi, Georgia, up to 60,000 people protest against the government of Mikheil Saakashvili. 2013 – A 6.1–magnitude earthquake strikes Iran killing 32 people and injuring over 850 people. 2013 – At least 13 people are killed and another three injured after a man goes on a spree shooting in the Serbian village of Velika Ivanča. 2014 – A student stabs 20 people at Franklin Regional High School in Murrysville, Pennsylvania. 2017 – Palm Sunday church bombings at Coptic Churches in Tanta and Alexandria take place. 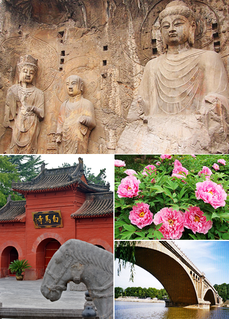 Luoyang is a city located in the confluence area of Luo River and Yellow River in the west of Henan province. Governed as a prefecture-level city, it borders the provincial capital of Zhengzhou to the east, Pingdingshan to the southeast, Nanyang to the south, Sanmenxia to the west, Jiyuan to the north, and Jiaozuo to the northeast. As of the final 2010 census, Luoyang had a population of 6,549,941 inhabitants with 1,857,003 people living in the built-up area made of the city's five urban districts, all of which except the Jili District are not urbanized yet. Year 1285 (MCCLXXXV) was a common year starting on Monday of the Julian calendar. Camilla Battista da Varano, O.S.C.,, from Camerino, Italy, was an Italian princess and a Poor Clare nun and abbess. She is venerated as a saint in the Catholic Church. The year 585 BC was a year of the pre-Julian Roman calendar. In the Roman Empire, it was known as year 169 Ab urbe condita. The denomination 585 BC for this year has been used since the early medieval period, when the Anno Domini calendar era became the prevalent method in Europe for naming years. AD 93 (XCIII) was a common year starting on Tuesday of the Julian calendar. At the time, it was known as the Year of the Consulship of Pompeius and Priscinus. The denomination AD 93 for this year has been used since the early medieval period, when the Anno Domini calendar era became the prevalent method in Europe for naming years. Saint Waltrude is the patron saint of Mons, Belgium, where she is known in French as Sainte Waudru, and of Herentals, Belgium, where she is known in Dutch as Sint-Waldetrudis or -Waltrudis. Both cities boast a large medieval church that bears her name. Dietrich Bonhoeffer was a German pastor, theologian, anti-Nazi dissident, and key founding member of the Confessing Church. His writings on Christianity's role in the secular world have become widely influential, and his book The Cost of Discipleship has been described as a modern classic. Saint Materiana is a Welsh saint, patron of two churches in Cornwall and one in Wales. Alternative spellings are Madrun and Madryn. The name was corrupted to "Marcelliana" in medieval times. Another spelling of her name sometimes used is "Mertheriana" or "Merthiana", resembling the Welsh merthyr - "martyr". May 29 is the 149th day of the year in the Gregorian calendar. 216 days remain until the end of the year. ↑ "CAIN: Sutton Index of Deaths". Cain.ulst.ac.uk. 1990-04-09. Retrieved 2016-12-31. ↑ Champagne, Duane (2001). The Native North American Almanac: A Reference Work on Native North Americans in the United States and Canada. Gale Research. ISBN 9780787616557. ↑ Victor, Daniel; Stevens, Matt (2017-04-10). "United Airlines Passenger Is Dragged From an Overbooked Flight". The New York Times. ISSN 0362-4331 . Retrieved 2019-04-08. Wikimedia Commons has media related to April 9 .